JUMLA, May 28: Kali Bahadur Rawat of Lihi Gaun of Jumla claims that his village was known as the storehouse of grains until a decade ago. Farmer never had to worry about water for irrigation as there used to be sources of water in abundance. Locals used to grow enough crops for themselves while the excess production was sold in the market. However, those sources of water have dried up in the recent days due to prolonged drought. During winter, there used to be heavy snowfall for three months and incessant rainfall in the monsoon never made farmers worry about their crops. But now, locals hardly get to witness snow and also have to wait for timely rainfall. According to Jagimane Pariyar of Rara Sitanagar, sometimes there is no rainfall and there are days when rainfall is so heavy it invites flood, landslides and other natural calamities. As per the locals, they haven't experienced proper snowfall since 2001. They lament that the level of snow has decreased significantly in the recent years. There was a time when even adults could not cross the Tila River but now even children can cross it without any difficulty. Earlier, there were three sources of drinking water around Rara Sitanagar but those have started drying up now. 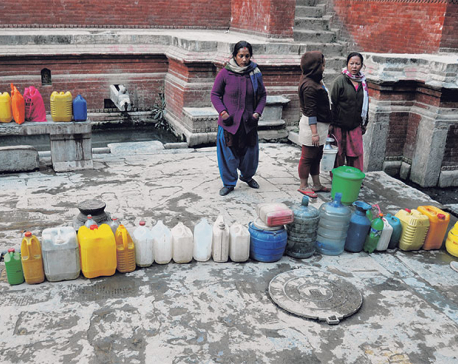 "This has compelled us to fetch water by staying in queue," said Pariyar. He further informed that shortage of water has also ensued disputes and arguments among the neighbors. Decreasing level of water in rivers and drying sources of water have resulted in low productivity, says Singh Budha of Kudari Daniwada. Unplanned settlements and deforestation have contributed to the drying up of water sources. The water provided by Dumkali Drinking Water Project is not enough for the locals. As there are no other sources of water, locals are obliged to use the contaminated water of the nearby river which often leads to various illnesses. Local units have been making efforts to find out alternative sources of irrigation. Increasing number of water-borne diseases has also raised concerns among the villagers. 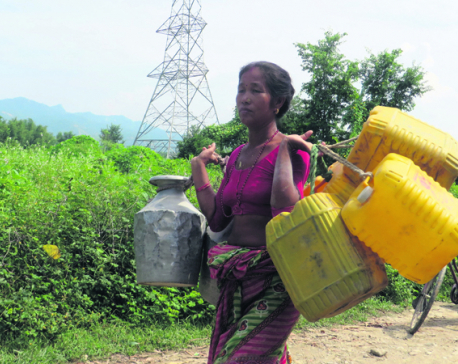 In Kudari, out of the total six water sources, four have dried up adding to the woes of the locals. Furthermore, decreasing level of water, pollution and use of poisonous chemicals have led to the decline of fish population and other aquatic animals in the Tila River. As informed by the locals, fish population has decreased by more than 40 percent.